New book, 457 pages. It was 1950, a brutally cold November in North Korea, and the war seemed all but over. And then a force of nearly 70,000 Chinese "volunteers" crossed the Yalu River, encircling the 30,000 United Nations troops at the Chosin Reservoir. The epic story of what followed - one of the iconic battles in Marine history - is told for the first time in gut-level detail in this book. 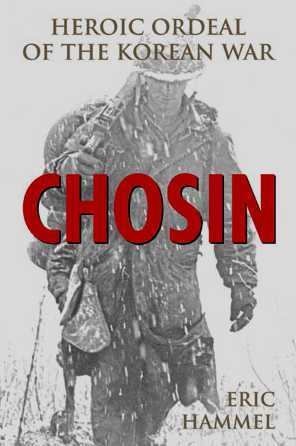 From the point of view of the men in the foxholes and tanks, outposts and command posts, Chosin offers a harrowing, firsthand account of the 1st Marine Divisions breakout battle against overwhelming Chinese forces in the bitter North Korean winter. Seasoned military historian Eric Hammel describes the errors and miscalculations by American higher-ups that left the division strung out at the end of a narrow road scores of miles from the sea. Then he plunges into the action: the massing of Chinese forces; the punishing climate and terrain; the high-level over-confidence that crippled the American command; and the onset of the overpowering Chinese assault. His account provides a wealth of tactical and human detail and small unit action: from an intelligence officers efforts to make sense of conflicting reports, to engineers improvising a bridge from logs and snow, from Marines marching to POW camps, to a battle-weary messengers discovery of headquarter staff safely ensconced behind friendly lines, settling down in formal dress to a full-course dinner. The result is the most complete book ever written on this heroic battle, a masterful narrative from the perspective of those who fought. This item was added to our catalog on Monday 12 May, 2008.